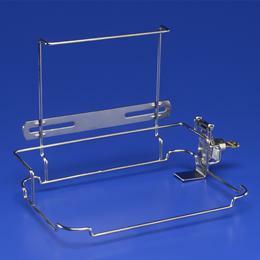 Brackets And Cabinets: Economical Wall Mounting Brackets Provide An Unobtrusive Method For Mounting Containers. Easy To Clean And Suitable For A Variety Of Decors. Containers Are Secured In Locked Enclosure. Cabinets Feature A Tinted Viewing Window That Allows Contents To Be Viewed By Hospital Personnel, But Not By Others. Wire Bracket, Locking, For Mds705201, Mds705202 & Mds706202.